Albuquerque's "Mariachis de Nuevo México" identity was the inaugural winner of the Copa de la Diversión event series. LAS VEGAS - The Albuquerque Isotopes are having themselves quite a Winter Meetings. Sunday, the Triple-A Colorado Rockies affiliate recieved the James H. Johnson President's Award for "most complete franchise." The following morning, they became the inaugural winners of Minor League Baseball's Copa de la Diversión event series. Copa de la Diversión, an initiative designed to engage with Hispanic fans, features Minor League teams adopting Spanish-language identities. The Isotopes, one of 33 teams to participate in 2018, played four games as the Mariachis de Nuevo México. 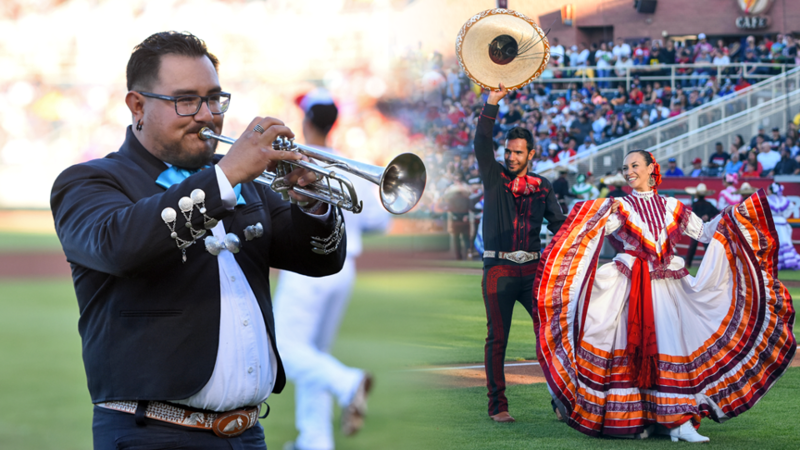 Minor League Baseball's Latinx Advisory Committee voted the Mariachis as the top identity, based on criteria such as attendance, marketing dollars invested, revenue gains and relevant community partnerships. Albuquerque emerged triumphant over a quartet of fellow semi-finalists: Monarcas de Eugene (Eugene Emeralds), Cucuys de San Bernardino (Inland Empire 66ers of San Bernardino), Cielo Azul de Oklahoma City (Oklahoma City Dodgers) and the Flying Chanclas de San Antonio (San Antonio Missions). "With the staff that we have I knew we'd absolutely put our best effort into it and make it as good as we possible could," said Isotopes general manager John Traub, speaking shortly after finding out his team had won. "We didn't really do it for the competition, to win the trophy....When we started, it was, 'Okay, what is going to resonate with the community and how are we going to embrace what Minor League Baseball is trying to do?'" Albuquerque general manager John Traub, flanked by marketing director Dylan Storm and director of retail operations Kara Hayes. The "Mariachis" name name was the result of an October 2017 staff brainstorming session, conducted just days before the Copa de la Diversión submission deadline. The accompanying logo, featuring a sugar skull that "pays homage to the importance of Día de los Muertos in the Hispanic culture," was designed internally by Minor League Baseball. "We kind of came up with the realization that Mariachis provide the soundtrack to people's lives," said Traub. "When people are born, when they graduate, when they get married, all these celebrations throughout their life, including funerals, mariachis are a part of it. Just like baseball is a part of people's lives. So there's a lot of synergy there and a lot of things we can build on, and we did. "But it was more than just the logo, it was more than just the name. We were trying to be authentic about how we went about this, so we partnered with the Albuquerque Hispano Chamber of Commerce. Got their input. They directed us in a lot of different ways to make sure we were being true to what the Mariachis are, and what's authentic. We're in a heavily Hispanic community, so if we were just trying to do something to sell a couple of tickets, people would see right through that. So we wanted to make sure that we were really hitting an emotional nerve with people in the community....[The Hispano Chamber of Commerce] had us come in and speak to their board of directors, and these are business leaders throughout the Hispanic community. Throughout the community, period. They gave us advice on how to have the mariachis bands playing, and the dancers, and just the overall atmosphere in the stadium. Let's bring this party alive. We already have a good partnership with them and friendships with these folks, but they told us how to have a party. A true New Mexican party." The Mariachis de Nuevo México was announced on March 20th, at an event heavily covered by local media. The team processed over 300 merchandise orders that afternoon, setting the stage for an onfield debut that exceeded all expectations. It was Saturday, May 5 - Cinco de Mayo - and a franchise-record 16,995 fans showed up at Isotopes Ballpark for the occasion. "Each [Mariachis] game that we did had its own theme," said Traub. "The first one had fireworks.The second was a Taco Tuesday. We didn't know how that was gonna go, it was a Tuesday in June and we had over 13,000 people there. That's pretty significant. And then a Friday night in July, we gave away a beer stein, a really nice ceramic beer stein all logoed out with the Mariachis. And then our last one was a bobblehead of the Mariachi playing a guitar. He was playing a guitar, and his arm bobbles." Traub said that, next season, there will be five Mariachis de Nuevo México nights at the ballpark. "We're gonna continue to do themes and giveaways," he said. "How do you make something that's already awesome, make it even better?...it's funny, with the food identities, this identity, other things that we've done, you almost risk creating an identity crisis for yourself. But I think we've been pretty respectful of how we've gone about it. We don't want to take away from anything Isotopes, but it's kind of a different experience. That's kind of the challenge for us, to keep everything elevated to the level of expectations that our fans have come to have." Going into 2019, Traub is confident that his team can meet those expectations. "We're very community focused....but this is something at a different level that just means something to the core of the people and the population of that community," he said. "Because they grew up with the Mariachis, they've been hearing this music ever since they were young. So that's one thing that has been pretty cool about this. Over the course of the summer I've had so many people come up and thank us for doing it the way we did. It took me back a little bit - we're thanking you for coming out and supporting us, yet they're thanking us for doing it in a respectful manner. So, it's been good."